Who is Degree? Clinical Protection for? 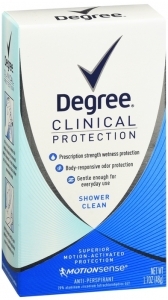 Anyone who does not want to be held back by perspiration or odor will benefit from Degree clinical protection levels. Unbeatable clinically proven protection without a preion. Patented encapsulated fragrance technology. Unique skin moisturizing ingredient, clinically proven to reduce skin irritation. Satisfaction Guaranteed We guarantee your full satisfaction or we will replace or refund your purchase. Reduces underarm wetness. 24 hour protection. Extra effective. Apply to underarms only. Before bed, apply two clicks of product to each underarm. For maximum protection, apply to underarms before going to bed. While resting, the TRIsolid? formula acclimates to the body, forming a deep level of protection. This protection lasts throughout the following day, even after a shower. Degree? Clinical Protection can also be applied in the morning.